Department of Orthopaedics, University Medicine Rostock, Doberaner Str. 142, 18057 Rostock, Germany. Introduction: Periprosthetic fractures are severe injuries that demand the surgeon’s full expertise and special diagnostic and therapeutic strategies. A major complication is the occurrence of an infectious nonunion, including an ascending infection from the fracture site to the arthroplasty. Case Report: This case report presents on a patient with a well-functioning revision total knee arthroplasty (TKA) who suffered a periprosthetic tibia fracture. Initial treatment with plating failed and the fracture had to be revised due to an infectious non-union with a multidrug-resistant Staphylococcus epidermidis, and its eradication was complicated by septic loosening of the patient’s knee arthroplasty. 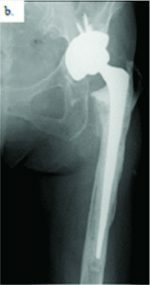 After multiple revisions of the nonunion, a two-stage exchange arthroplasty with a partial replacement of the distal femur due to a bone defect was necessary to obtain an acceptable result. Conclusion: The objective of this case report is to present an individual surgical strategy in a complex case of periprosthetic fracture and TKA with major complications. It is shown that the infection of the bone and implants is a challenging situation for surgical treatment. There is still no optimal management strategy due to missing standards as well as controversies in treatment. Periprosthetic fractures are seen at increasing frequency due to a rising rate of arthroplasty procedures in the aging population. The cumulative incidence of periprosthetic tibial fractures ranges from 0.3% after primary total knee arthroplasty (TKA) to 38% after revision surgery. However, periprosthetic fractures are still rare, and treatment strategies have not been standardized to date [1,2]. Felix et al. classified periprosthetic fractures of the tibia considering the dislocation, stability of the prosthesis and appearance of the fracture. According to the classification, different surgical strategies have been developed to provide the best outcome. Infections are major reasons for nonunion after bone fractures in general. They account for up to 15% of all nonunions. Fractures of the tibia carry a higher risk of nonunion due to limited perfusion and poor soft tissue coverage [4,5]. Infectious nonunion is caused by different pathogens, mainly Staphylococcusspp including the multidrug-resistant spectrum . The infection of arthroplasty is a severe complication with a large economic impact due to the high cost of treatment. The incidence of infection in revision TKA varies from 1% to 15% . With regard to septic TKA, treatment strategies have been standardized with mainly two-stage revision concepts, but also one-stage revisions concepts have been described. Frequent pathogens found in septic TKA are mainly from skin flora [8-10]. A main problem in revision TKA is the bone loss that remains after eradication of infection . The simultaneous occurrence of a fracture nonunion and infection of arthroplasty is rare and aggravates the situation for both surgeon and patient. In the presented case of a periprosthetic fracture, surgical procedures aim primarily to restore the bony union by sufficient fixation. With the detection of an infection, the strategy has to be extended to the eradication of the infected TKA and nonunion. In particular, revision TKA always carries a higher risk of further complications . The present case report concerns a 69-year-old male patient who was admitted to the department of traumatology and orthopaedic surgery. 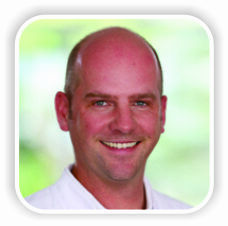 The patient was admitted in February 2014 after he had a bicycle accident. Standardized X-rays of the affected leg showed a periprosthetic fracture of the tibia and an upper fracture of the fibula which was negligible (Felix [Mayo] classification Type IIIa, Fig. 1). In the medical history of the left knee, the patient underwent primary TKA in May 2004 due to osteoarthritis. Furthermore, revision surgery was performed with the implant changed to a constrained TKA system due to an aseptic loosening in October 2013. The patient reported a satisfying functional and subjective outcome of his left knee before the accident. We saw the patient with a painful leg but without any clinical signs of compartment syndrome. Diagnostics and pre-operative planning were completed with a computed tomography scan and laboratory counts. Primary care included stabilization with a knee joint bridging external fixator and a puncture of the knee. 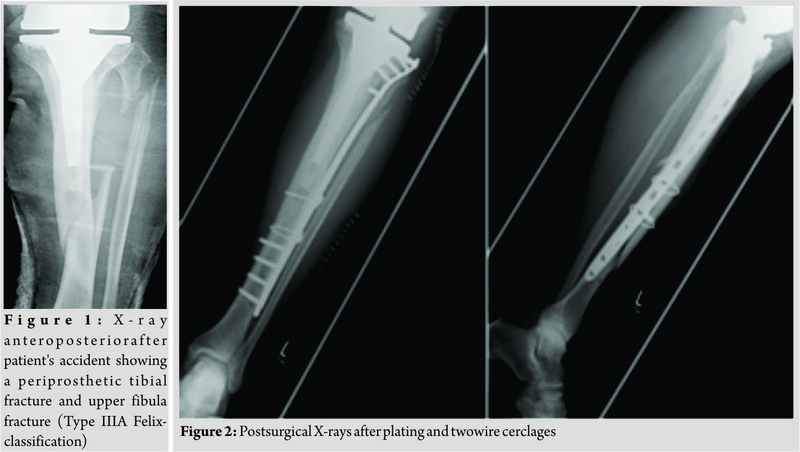 After soft tissue conditions were improved the external fixator was removed, andthe tibial fracture was stabilized with a plate and two wire cerclages (less invasive stabilization system [LISS], 13 screw holes, Synthes GmbH, Umkirchbei Freiburg, Germany) (Fig. 2). Inpatient care consisted of mobilization with two crutches and a partial weight bearing (20 kg). Microbiological examination of the initial joint puncture and all samples taking during the operation was negative. The patient was discharged with unremarkable wound conditions and normal blood counts. The patient was readmitted with persistent pain and serous secretion from a necrotic area of the distal wound 3months after discharge. Radiological examination showed a delayed union of the fracture. Immobilization in a cast and local resection of the necrosis could not prevent wound worsening within 1month. Therefore, revision surgery of the wound with a deep debridement had to be performed. Due to the missing wound consolidation, soft tissue debridement was performed in two more surgeries. The first procedure was completed with an extensive cleansing, insertion of a gentamicin-impregnated sponge, and an occlusive vacuum bandage. Antibiotic therapy was accomplished with a combination of cefuroxime (3 × 1.5 g i.v., Fresenius Kabi Austria GmbH, Graz, Austria) and clindamycin (2 × 600 mg, MIP Pharma GmbH, Blieskastel, Germany). This therapy was given in accordance with the spectrum of resistance of a multi-sensitive Staphylococcus aureus and Enterobacter cloacae (wound sample) and S. aureus, Finegoldia magna, and Corynebacterium xerosis (fracture site samples). As there was no tendency toward healing, a further surgery with new lateral and medial plating was performed. The distal wound lesion was covered with a MESH graft. Post surgical therapy included mobilization with full weight bearing. In addition, osteoanabolic therapy with Teriparatide (250 µg/ml, Lilly Germany GmbH, Bad Homburg) to improve fracture healing was applied. Antibiotic treatment was continued for 6 weeks. Histological examination confirmed an underlying chronic bone infection and the nonunion. The blood counts were normal when the patient was discharged after 27 days. 2 weeks after hospital discharge, the patient reported a sudden, atraumatic pain with immobilization. X-rays documented a fracture dislocation with the failure of the medial and lateral device and, in addition to these findings, a new distal fracture of the fibula (Fig. 3). There were no signs of consolidation at the former fracture site, and revision surgery was necessary. With the exception of two broken screw bodies, all devices were removed. A triple-plate reosteosynthesis was performed, including a 14-hole inverse LISS plate on the medial side, a 12-hole limited contact dynamic compression (LCDC) plate at the dorsal tibia aspect, and a 7-hole reconstruction plate at the new distal fibula fracture (all devices, Synthes GmBH, Umkirchbei Freiburg, Germany, Fig. 3). 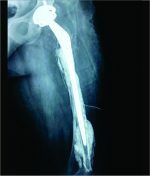 The nonunion was resected,and the lesion was filled with an equilateral autologous spongiosa graft of the femur taken by a reamer-irrigator-aspirator system. A multidrug-resistant Staphylococcus epidermidis (MRSE) was isolated from the microbiological samples. Since the MRSE had also been isolated during prior surgeries, it was considered a major pathogen; therefore, antibiotic treatment with cefuroxime and clindamycin was changed to vancomycin (2 × 1 g, MIP Pharma GmbH, Blieskastel, Germany) and rifampicin (2 x 600 mg, Riemser Pharma GmbH, Greifswald, Germany). The patient was discharged with an oral combination of linezolid (2 × 600 mg, MIP Pharma GmbH, Blieskastel, Germany) and rifampicin (2 × 600 mg, Riemser Pharma GmbH, Greifswald, Germany) for additional 4weeks. Blood values were taken frequently, revealing normal WBC counts and regressive CRP values. A follow-up was planned at our outpatient clinic at the end of the period of unloaded mobilization 8weeks after surgery. The initial follow-up and subjective outcome were satisfactory at 8weeks postoperatively. There was no evidence of a persistent infection. The patient had completed 2months of mobilization without weight bearing and had started partial weight bearing without any problems a few days before. Therefore, slowly increasing weight bearing to improve inpatient rehabilitation and functional outcome of the affected limb was recommended. The patient was readmitted from rehabilitation to our department in January 2015 due to a progression of knee pain and moderately elevated paraclinical values of infection. Examination at admission showed normal wounds at the fracture site, but at the knee, the skin was irritated and swollen. X-rays showed a small amount of new bone formation at the medial and lateral side of the former tibial fracture, but a fracture union was still not present. A knee puncture was performed, and the microbiological assessment showed a known MRSE, previously of the fracture site, now with a limited spectrum of sensitivity. A bone and leukocyte scintigraphy showed a persistent (infectious) nonunion and aseptic loosening of the TKA due to ascending infection. With the additional septic focus, there was a need for complete removal of all implants. Therefore, a two-stage implant change was planned. After removal of all implants, a deep debridement was performed,and a hand-formed bone cement knee spacer including antibiotics (Copal G+C 1 × 40 mg, Heraeus Medical GmbH, Wehrheim, Germany) was implanted. Microbiological and histological samples taken during surgery confirmed the chronic bone infection and septic TKA. An antibiotic treatment was started perioperatively and was given for 6weeks with a combination of vancomycin (2 × 1 g, MIP Pharma GmbH, Blieskastel, Germany) and rifampicin (2 × 600 mg, Riemser Pharma GmbH, Greifswald, Germany) followed by an oral mono-therapy with linezolid (2 × 600 mg, PHARMACIA GmbH, Karlsruhe, Germany). The mobilization was performed with full weight bearing using an individual constructed lower limb load-relieving orthosis by Allgöwer. After an antibiotic-free interval of 2 weeks, the patient was admitted for a diagnostic joint puncture. However, the knee puncture again showed purulent synovial fluid with the isolation of the prior known MRSE. The remaining broken screws and a bone abscess close to the former nonunion was removed within revision surgery. A tibial nail (T2, 315 × 10 mm, Stryker Trauma GmbH, Schönkirchen, Germany) was used for temporary intramedullary splinting and to provide further consolidation of the circumferential callus bone. Furthermore, a new bone cement spacer (Palacos R+G, 2× 40 mg, Heraeus Medical GmbH, Wehrheim, Germany) with two additional antibiotic-impregnated chains (2 × 30, Biomet Deutschland GmbH, Berlin, Germany) was implanted (Fig. 4). MRSE was ascertained everywhere except for the distal femur. In accordance with the pathogen’s spectrum of resistance, a new 6-week course of therapy with vancomycin (2 × 1 g, MIP Pharma GmbH, Blieskastel, Germany) was begun and switched to oraltherapy with linezolid (2 × 600 mg, PHARMACIA GmbH, Karlsruhe, Germany) only. The previous mobilization using the orthesis was continued. In August 2015, a puncture of the knee joint after an antibiotic-free interval showed no pathogens. Clinical examination was without any signs of persistent infection. X-rays showed only a partial consolidation of the fracture at the tibia, but the fibula was consolidated. Therefore, reimplantation of a special revision TKA, also addressing the tibial fracture was scheduled. Revision surgery included removing the nail and all other foreign bodies and an extensive debridement with reaming of the intramedullary cavity of the tibia. The surgery was completed by a partial replacement of the distal femur due to bone loss and a modular revision TKA was implanted (Mega C, modular tibia with a 14/280 mm cementless tibia stem, modular femur condyle with a 16/100 mm cemented stem, Waldemar Link GmbH and Co. KG, Hamburg, Germany; Fig. 5). The tibial fracture site was splinted stable with the long cementless stem by the means of a press fit. Intraoperative range of motion of the knee joint was extension/flexion of 0/0/100. The patient underwent full weight bearing using two crutches and patient’s orthosis for 8weeks postoperatively. Post-operative X-rays showed no malalignment of the TKA and good fracture stabilization by the tibial stem. Laboratory counts and infectious values normalized, and there was a remarkable improvement in the patient’s quality of life. A new rehabilitation was scheduled after the inpatient time of 3weeks. The patient was discharged with an active ROM of 90° in flexion. He was able to exercise on an even track for more than 20 min. The patient underwent 4months of follow-up after successfully completing rehabilitation. The patient was able to walk under full weight bearing with the aid of two crutches. Occasionally, the orthosis is carried for long distances. He reported an intermittent pain at the superficial goose’s foot in cases of higher stress. There was a temporary relief after a local anesthetic infiltration, but the pain, in general, was described as moderate. All wounds were dry and without any signs of infection. The active range of motion was tested with flexion of 0/0/90°. The patient was seen for the last follow-up 15 months after revision TKA with only moderate pain at the medial knee site. Mobilization was performed with the use of one crutch, and knee flexion is limited to 80°, which is described as acceptable for patient’s daily activities. The patient is confident with the functional outcome and quality of life. This case report presents a periprosthetic tibia fracture with major complications. The management of periprosthetic fractures of the tibia remains a challenge in orthopedics and trauma surgery. There is a high variation in the epidemiology of tibial shaft fractures. According to a population-based study by Larsen et al. ,the incidence of tibial shaft fractures is 16.9/100 000 per year. Periprosthetic fractures of the tibia are found in up to 0.4% of cases after TKA and even more frequently after revision TKA . Data are lacking on the epidemiologic numbers of infectious nonunions in tibial fractures. However, the rate of revision to promote bone union is non-negligible. Periprosthetic fractures are commonly related with a long and costly treatment and a high incidence of complications . Various surgical pathways aim to restore an anatomic reduction and sufficient fixation of unstable and dislocated fractures [16,17]. The spectrum of procedures ranges from open reduction and internal fixation with screws and locked plating to the implantation of a megaprosthesis [18,19]. Major complications after fracture fixation are nonunion and infection. Although there is a lack of evidence, other risk factors for complications after periprosthetic fracture fixation such asdiabetes, poor bone stock, and osteoporosis have been described . However, data on periprosthetic tibia fractures aremissing. Herrera et al. systematically compared the outcomes of different fixation techniques in the management of periprosthetic femur fractures and noted a nonunion rate of 12% for conventional plating, 5.3% for locked plating, and 1.5% for retrograde intramedullary nailing. Retrograde nailing was associated with a significant risk reduction of 87% for a nonunion compared to non-locking plates. In addition, a recent meta-analysis showed no significant differences in nonunion in patients who underwent locking plate fixation (10.9%) and intramedullary nail fixation (14.0%) for periprosthetic fractures of the distal femur . 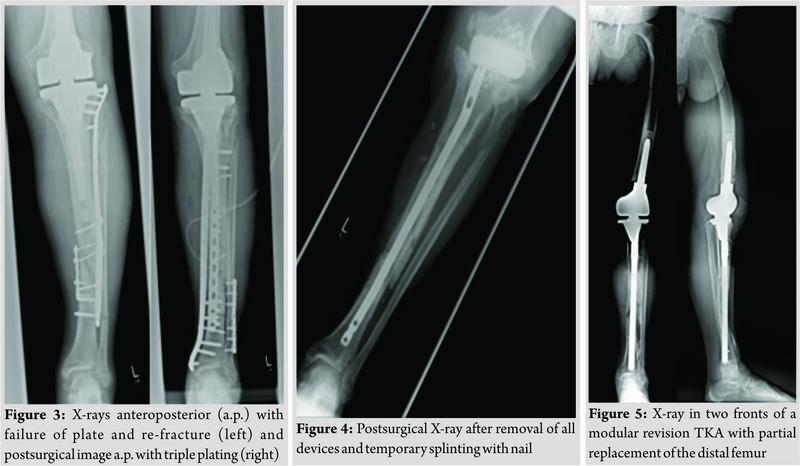 Due to similar outcome rates and a broader range of application, the locking plate seems to be a good alternative to retrograde intramedullary nails for the treatment of periprosthetic fractures. Infections are a well-known reason for delayed union and nonunion. Meta-analysis showed an infection rate of 5.3% after locking plate fixation of a periprosthetic femur fracture with TKA . Depending on the patient’s comorbidities, the microbiological findings and surgical history, one-stage and two-stage exchange strategies are possible . Compared with the exchange in chronic infectious TKA arthroplasty, a single-staged exchange surgery in chronic infectious osteosynthesis is possible if the pathogen is known. If the known pathogen is “difficult-to-treat” (e.g., methicillin-resistant S. aureus (MRSA) and small-colony variants of staphylococci) a two-stage revision surgery is preferred. Trebse et al. could show an implant survival of 86% after 3years with implant retention and a standardized antimicrobial protocol. With regard to the control of infection, Romano et al. could show that two-stage regimens are superior to one-stage surgeries in TKA revision. There are comparable data for cases with the revision of total hip arthroplasty. One-stage surgery can be performed with a survival rate of up to 93.7% compared with a rate of up to 100% with the two-stage concept . However, in this case, the existence of two septic localizations and a “difficult-to-treat” pathogen necessitated a two-stage exchange arthroplasty, which serves as the current standard procedure for the clearance of chronic infection . The majority of early and late infections in total hip and knee arthroplasty are caused by coagulase-negative staphylococci such as S. epidermidis in 20% to 30% of cases. Polymicrobial pathogens are found in 12%–19% of cases . Claassen et al. found an S. epidermidis in 8of 50cases in the second-stage procedure of TKA revision. In five of the cases, there was a discrepancy between the pathogens verified at the first-stage operation, similar to our case. Polymicrobial infections, pathogen multiresistance, and formation of a biofilm are factors that have an eminent influence on the outcome . The treatment of prosthetic infections caused by biofilm-forming bacteria is complicated due to a protecting matrix that prevents antibiotics from penetrating and inhibiting bacterial growth . It is questionable in this case whether the TKA was already infectious when the patient was first admitted after his accident, as he described an unknown swelling of his left knee, but no pathogens were found in the knee puncture cultures. Maybe an extension of diagnostics (e.g., polymerase chain reaction [PCR]) could have detected bacterial samples. Although the conventional methods for the investigation of microbiological specimens are well established, the detection of bacterial pathogens in nonculturable specimens is complex. In cases without any positive isolation in the microbiological cultures, the amplification of 16S rRNA by PCR or other molecular techniques may contribute to a higher rate of detection of nonculturable pathogens, especially in nonunions that seem to be aseptic [6, 32]. With regard to all diagnostic tools, the reliability varies between microbiological, radiological, and histological methods for the diagnosis of an infected arthroplasty. Finally, the infection has to be validated histologically and by proof of pathogens in microbiological culture . In accordance with the latest medical findings, sonication of the removed implants could optimize the microbiological testing results, as it doubles the detection rate of polymicrobial organisms, but the use of PCR and sonication is limited and established mainly in specialized centers. 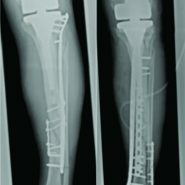 A periprosthetic fracture, an infectious nonunion and aseptic loosening of an arthroplasty represent, each in itself, a challenging complication in orthopedics and trauma surgery. This case is certainly very complex due to the successive occurrence of these complications. The lack of standards requires an individual strategy for these patients and specific surgical competencies to obtain the optimal treatment. However, it has to be considered that the number of further complications, even after an adequate therapy, remains high. Our approach represents one option for successful treatment and may contribute to an improvement, but we do not claim to have discovered the optimal pathway. There is a need for further investigation in extended studies and the development of standard regimens. A periprosthetic fracture of the knee is a challenging situation and may be associated with further major complications like infection. 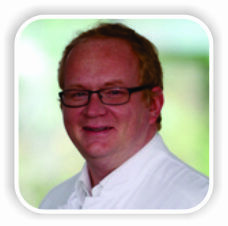 Diagnostic and therapeutic strategies demand a surgeon’s full expertise. 1. Agarwal S, Sharma RK, Jain JK. Periprosthetic fractures after total knee arthroplasty. J Orthop Surg (Hong Kong) 2014;22:24-9. 2. 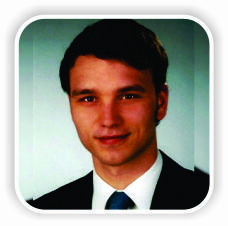 Hanschen M, Biberthaler P. Risk factors for failure of osteosynthesis. After periprosthetic fractures of the knee joint. Orthopade2014;43:541-8. 3 Felix NA, Stuart MJ, Hanssen AD. Periprosthetic fractures of the tibia associated with total knee arthroplasty. Clin OrthopRelat Res 1997;345:113-24. 4. Militz M, Hackt S, Hungerer S, Öhlbauer M, Bühren V. Infectious non-union. Trauma Berufskr 2014;16 Suppl 4:444-51. 5. Megas P, Saridis A, Kouzelis A, Kallivokas A, Mylonas S, Tyllianakis M. The treatment of infected nonunion of the tibia following intramedullary nailing by the Ilizarov method. Injury 2010;41:294-9. 6. Gille J, Wallstabe S, Schulz AP, Paech A, Gerlach U. Is non-union of tibial shaft fractures due to nonculturable bacterial pathogens? A clinical investigation using PCR and culture techniques. J Orthop Surg Res 2012;7:20. 7. Rajgopal A, Vasdev A, Gupta H, Dahiya V. Revision total knee arthroplasty for septic versus aseptic failure. J Orthop Surg (Hong Kong) 2013;21:285-9. 8. Martínez-Pastor JC, Maculé-Beneyto F, Suso-Vergara S. Acute infection in total knee arthroplasty: Diagnosis and treatment. Open Orthop J 2013;7:197-204. 9. Holmberg A, Thórhallsdóttir VG, Robertsson O, W-Dahl A, Stefánsdóttir A. 75% success rate after open debridement, exchange of tibial insert, and antibiotics in knee prosthetic joint infections. Acta Orthop2015;86:457-62. 10. Yang Y, Yang F, Zhang Z, Li H, Chen J. Distribution and drug sensitivity of pathogens in patients with periprosthetic joint infections after primary total knee arthroplasty. ZhongguoXiu Fu Chong Jian Wai Ke Za Zhi2014;28:848-52. 11. Sculco PK, Abdel MP, Hanssen AD, Lewallen DG. The management of bone loss in revision total knee arthroplasty: Rebuild, reinforce, and augment. Bone Joint J 2016;98-B 1 Suppl A:120-4. 12. Burnett RS, Kelly MA, Hanssen AD, Barrack RL. Technique and timing of two-stage exchange for infection in TKA. Clin OrthopRelat Res 2007;464:164-78. 13. Larsen P, Elsoe R, Hansen SH, Graven-Nielsen T, Laessoe U, Rasmussen S. Incidence and epidemiology of tibial shaft fractures. Injury 2015;46:746-50. 14. Rocca GJ, Leung KS, Pape HC. Periprosthetic fractures: Epidemiology and future projections. J Orthop Trauma 2011;25 Suppl 2:S66-70. 15. 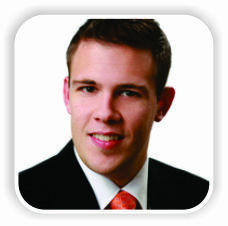 Militz M, Bühren V. Replacement of infected knee and hip endoprostheses. Chirurg2010;81:310-20. 16. Mittlmeier T, Beck M, Bosch U, Wichelhaus A. Periprosthetic knee fractures. Orthopade2016;45:54-64. 17. Sarmah SS, Patel S, Reading G, El-Husseiny M, Douglas S, Haddad FS. Periprosthetic fractures around total knee arthroplasty. Ann R Coll Surg Engl2012;94:302-7. 18. Yoo JD, Kim NK. Periprosthetic fractures following total knee arthroplasty. Knee Surg Relat Res 2015;27:1-9. 19. Windhager R, Schreiner M, Staats K, Apprich S. Megaprostheses in the treatment of periprosthetic fractures of the knee joint: Indication, technique, results and review of literature. Int Orthop2015;39:1945-50. 20. 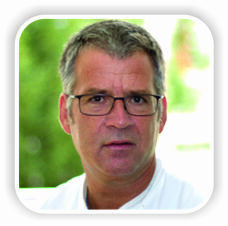 Hanschen M, Biberthaler P. Risk factors for the failure of osteosynthesis. Orthopäde2014;43:541-8. 21. Herrera DA, Kregor PJ, Cole PA, Levy BA, Jönsson A, Zlowodzki M. Treatment of acute distal femur fractures above a total knee arthroplasty: Systematic review of 415 cases (1981–2006). Acta Orthop2009;79:22-7. 22. Shin YS, Kim HJ, Lee DH. Similar outcomes of locking compression plating and retrograde intramedullary nailing for periprosthetic supracondylar femoral fractures following total knee arthroplasty: A meta-analysis. Knee Surg Sports TraumatolArthrosc2016;???:???. 23. Renz N, Perka C, Trampuz A. Management of periprosthetic infections of the knee. Der Orthopäde2016;45:65-71. 24. Trebse R, Pisot V, Trampuz A. Treatment of infected retained implants. J Bone Joint Surg Br 2005;87:249-56. 25. Romanò CL, Gala L, Logoluso N, Romanò D, Drago L. Two-stage revision of septic knee prosthesis with articulating knee spacers yields better infection eradication rate than one-stage or two-stage revision with static spacers. Knee Surg Sports TraumatolArthrosc2012;20:2445-53. 26. Fink B. Revision of late periprosthetic infections of total hip endoprostheses: Pros and cons of different concepts. Int J Med Sci 2009;6:287-95. 27. Aggarwal VK, Rasouli MR, Parvizi J. Periprosthetic joint infection: Current concept. Indian J Orthop2013;47:10-7. 28. Sia IG, Berbari EF, Karchmer AW. Prosthetic joint infections. Infect Dis Clin North Am 2005;19:885-914. 29. Claassen L, Plaass C, Daniilidis K, Calliess T, von Lewinski G. Two-stage revision total knee arthroplasty in cases of periprosthetic joint infection: An analysis of 50 cases. Open Orthop J 2015;9:49-56. 30. Patenge N, Arndt K, Eggert T, Zietz C, Kreikemeyer B, Bader R, et al. Evaluation of antimicrobial effects of novel implant materials by testing the prevention of biofilm formation using a simple small scale medium-throughput growth inhibition assay. Biofouling 2012;28:267-77. 31. Fux CA, Costerton JW, Stewart PS, Stoodley P. Survival strategies of infectious biofilms. Trends Microbiol 2005;13:34-40. 32. Tunney MM, Patrick S, Curran MD, Ramage G, Hanna D, Nixon JR, et al. Detection of prosthetic hip infection at revision arthroplasty by immunofluorescence microscopy and PCR amplification of the bacterial 16S rRNA gene. J Clin Microbiol 1999;37:3281-90. 33. Gollwitzer H, Diehl P, Gerdesmeyer L, Mittelmeier W. Diagnostic strategies in cases of suspected periprosthetic infection of the knee. A review of the literature and current recommendations. Orthopade2006;35:904, 6-8, 10-6. 34. Janz V, Wassilew GI, Kribus M, Trampuz A, Perka C. Improved identification of polymicrobial infection in total knee arthroplasty through sonicate fluid cultures. Arch Orthop Trauma Surg 2015;135:1453-7. How to Cite This Article: Bonacker J, Darowski M, Haar P, Westphal T, Bergschmidt P. Periprosthetic Tibial Fracture with Nonunion and Ascending Prosthetic Joint Infection: A Case Report of an Individual Treatment Strategy. Journal of Orthopaedic Case Reports 2018 Nov-Dec; 8(6): 3-8.